(Newser) – Tavis McGinn spent six months doing a "very unusual" job at Facebook then decided he just didn't want to do it anymore. "I didn't feel proud to tell people I worked at Facebook," he tells the Verge. "I didn't feel I was helping the world." So what was he doing? After a three-year stint at Google, he had interviewed with the company hoping to do market research, but was offered and accepted a different role in April 2017: tracking exactly how the public views Mark Zuckerberg (as well as COO Sheryl Sandberg). 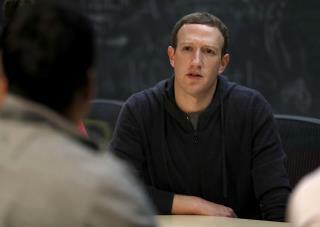 Using surveys and focus groups around the globe—as part of an effort he'll only describe as "very, very expensive"—he was supposed to track Zuckerberg's name recognition, trustworthiness, and likability. This is narcissism on a grand scale. not surprising... The purpose of facebook is to track your likeability and recognition in a population of people you don't give a fug about. Our world is so creepy now, isn't it.